ha Shannon was born in west London in 1991. She started her first novel at the age of fifteen. Between 2010 and 2013 she studied English Language and Literature at St Anne’s College, Oxford. In 2013, she published The Bone Season, the first in a seven-book series. The Mime Order followed in 2015. Both were international bestsellers and have been translated into twenty-six languages. Film rights have been optioned by the Imaginarium Studios and 20th Century Fox. In 2014, Samantha Shannon was included on the Evening Standard’s Power 1000 list. The Song Rising is her third novel. 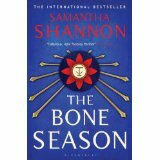 The Bone Season: Even a dreamer can start a revolution. Nineteen- year-old Paige Mahoney works in the criminal underworld of Scion London. Her job: to scout for information by breaking into people’s minds. For Paige is a dreamwalker, a clairvoyant and, in the world of Scion, she commits treason simply by breathing. The Mime Order: Paig e Mahoney has escaped the brutal prison camp of Sheol I, but her problems have only just begun: many of the survivors are missing and she is the most wanted person in London… As Scion turns its all-seeing eye on the dreamwalker, the mime-lords and mime-queens of the city’s gangs are invited to a rare meeting of the Unnatural Assembly. Jaxon Hall and his Seven Seals prepare to take centre stage, but there are bitter fault lines running through the clairvoyant community and dark secrets around every corner. Then the Rephaim begin crawling out from the shadows. But where is Warden? Paige must keep moving, from Seven Dials to Grub Street to the secret catacombs of Camden, until the fate of the underworld can be decided.